This shot pouch and powder horn were carried by George Richardson, a member of General Andrew Jackson's Kentucky Riflemen, at the Battle of New Orleans, January 8, 1815. They came into possession of his son Solomon Richardson, who in 1847 carried them across the plains, together with the Kentucky rifle used by his father. 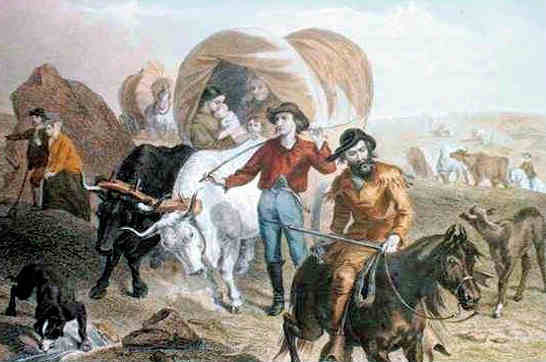 They were also carried by Solomon Richardson to the gold fields of California in 1849. 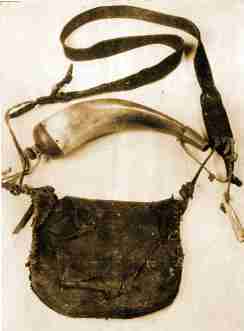 The shot pouch and powder horn were made by Daniel Boone and given by him to Shadrach Richardson Sr. who accompanied him from Virginia to Kentucky about 1783. The family relic was in possession of Milt Richardson until his death and since that time has been kept by his son Ward K. Richardson. The old Kentucky rifle has been lost. An account of the lives of the descendants of Shadrach and Betsy Richardson of Kentucky compiled from the family traditions and records covering the migration of its members from Kentucky to Illinois, Iowa, Oregon, and Utah. fast-dimming tradition handed down by word of mouth . . . . May I express the wish that this booklet may come in time to the attention of some descendants of the other eight children of Shadrach Richardson so that . . . they may again be united in a common knowledge of each other." He probably never dreamed there would one day be such a thing as an Internet, or that his words would use it to come to you. My name is Steve Richardson. Thomas Richardson was my great-grandfather.